It is getting closer. Can you feel the energy in the air? The chill running down your spine? It is gonna be a super spook-tacular Halloween here at the corral. The 13 Days of Halloween are rolling steadily along and many of you have wondered when this guy was gonna make the list. And I am sure a good many of you figured he would be the treat for Day 13, but the trick is on you. Straight from Smith’s Grove Sanitarium, the man who you never want to come home… Michael Myers. “I got some bubble gum!” “I got a chocolate bar!” Michael looked in his bucket and whispered, “I got a butcher knife.” And from then on the sleepy town of Haddonfield was never the same. See you tomorrow as we go to the Halloween dance with a “special” friend. 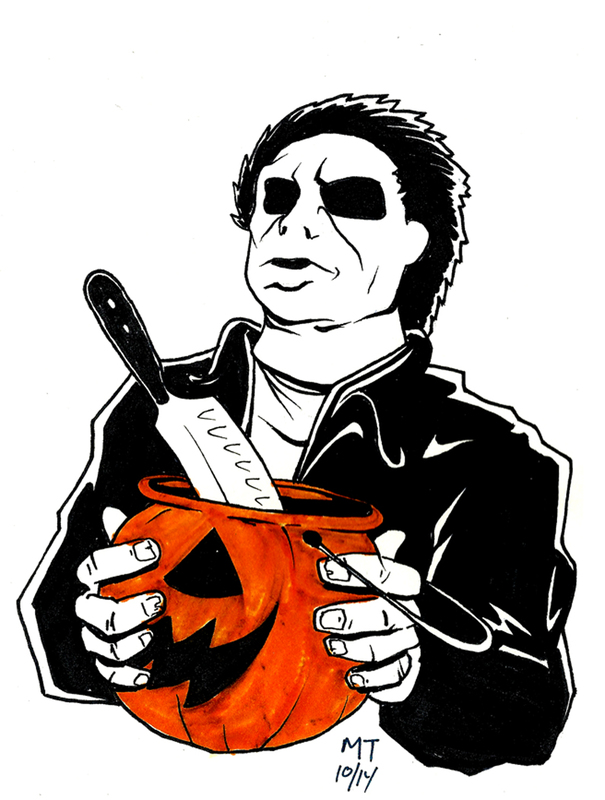 This entry was posted in 13 Days of Halloween, Halloween, Movie Monsters, Movies N Films, Retro Sketch. Bookmark the permalink. Any chance you can send the Kolchak Picture’s i payed for 2 years ago .